Roshi Joan asked me to say a few words about Aitken Roshi during the service. As I prepared to do that, I remembered just how radical Aitken Roshi was in his life and in his Buddhist practice. As I recounted before on this blog, I got a chance to spend three days with him back in 2005. 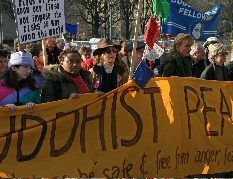 I’ve never forgotten his encouragement to me to ensure that the Buddhist Peace Fellowship would not forget its radical, anarchist roots, and to keep placing ourselves in harm’s way if need be for the protection of all beings and of the Earth. Some time after my trip to Hawai’i to meet Roshi, he sent me a gift in the mail – a copy of the book Death in the Haymarket: A Story of Chicago, the First Labor Movement, and the Bombing that Divided Gilded Age America. This was characteristic of his great generosity as well as his desire to educate fellow Buddhists about the mechanics of radical social change and anarchism. I still can hear his strong voice in my head: “It’s not enough to sit on the cushion.” Roshi’s heroes were people like Dorothy Day, Emma Goldman, Philip Berrigan, Daniel Ellsberg, and Kathy Kelley (of Voices in the Wilderness). As Buddhists and dhamma practitioners, I would love to see us having more conversations about what compassion and social change actually look like: locally, on the ground, in practice. Because it’s too easy for us to invoke these words — compassion, inner work, social change — and assume that everyone is on the same page. The truth is, we’re not all on the same page. And it’s not until after the event is over, on the subway ride home, when a gaggle of us start discussing in detail the relationship between inner and outer work, that these fundamental differences emerge, sharp and cold, like mountain peaks, from the soothing golden fog of Buddhist unity. 1. Mystified Mechanism. When we start doing the inner work of developing compassion and insight, our outer social justice work will automatically get good. How? Sometimes folks talk about spirituality helping to reduce burnout, or converting the motivation of anger into the motivation of compassion. But while both are wonderful benefits, neither speaks to the testable effectiveness of the particular outer work itself. 2. Healing As (Total) Resistance. Smiling at strangers on the subway is resisting militarism. 3. Social Change Relativism. Together, a growing movement is working for peace and justice in the world. From green business to prison meditation to high-school conflict resolution programs on MTV, signs of hope and change abound. Are all forms of progressive activism equally useful? No. But the shorthand of social change frequently obscures this fact. Coupled with a feel-good engagement paradigm, the ‘every little bit helps’ idea makes it very difficult to hold each other accountable for our political work and its actual outcomes. 4. Root vs. Radical. Radical political agendas fail to grasp the root cause of oppression: dualism. And ultimately, the best ways of overcoming dualism are through meditation and small-scale, intimate, interpersonal, compassion-building exercises. Even if dualism is the “root cause” of oppression, that doesn’t make it the best or most actionable point for resistance, always. Besides: why is this idea of dualism so pervasive and tenacious, anyway? In large part because of the political and material structures (i.e. schools, economies, hierarchical religious institutions) that train human beings. Without changing the power relations governing those material structures, there’s little hope of giving non-dualistic living, and appreciation for inter-being, a real shot on a global scale. Often, this gets construed to mean: build the best alternative society you can, and slowly it will change the entire society. Especially in Buddhist communities that prize extended retreat time, a decade of study with a realized Asian master, and this sort of removal from everyday householder society, there’s a danger of trying to build our sanghas into utopias, and assuming that they will automatically radiate peace and well-being into the world. Might be true on an individual or small-group level, but why should we believe that we can scale up well-being from personal transformation to world peace, without specific strategies for tackling enormous material systems? The interesting thing to me is how TO starts from the basis of effective organizing, and enfolds both inner and outer transformation from there. Too often, I think that many of us as engaged Buddhists give short shrift to the dimension of outer transformation, as well as the challenges in our relationships with each other, especially when there are power inequities based on race, class, and gender. It’s kind of like a spiritual/political bypass. Meanwhile, in Montague, MA, this week, hundreds of people are attending the Engaged Buddhist Symposium at the Zen Peacemaker Institute. I wonder if these conversations are happening there as well, if people are exploring where the radical edge of dharma lies, and how we as practitioners in this day and age, living in this profoundly broken yet beautiful world, can really get down in the dirt with all beings. If you’re at the Symposium, or if you have thoughts about all this, I’d love to hear your voice in the comments below. Posted in Harmony and Difference, Ruminations... and tagged Buddhist Peace Fellowship, Robert Aitken Roshi. Bookmark the permalink. Katie is right on the mark with all her points. Thank you for bringing this forward. Excellent, grounded perspectives. They remind me of Bonhoeffer’s indictment of what he called “cheap grace”: religion that comforts its adherents that they are better than The Others, while asking of them no commitment that demands a sacrifice. “when Christ calls a man,” Bonhoeffer declared, “he bids him come and die.” I am also reminded of two friends who, in recent elections, piously declared that they were spending time visualizing the victories of their favored candidates, but who could not be bothered to do any actual work for them. They were quite offended when I suggested that they do something concrete while visualizing. Seriously. Thank you Maia. I applaud the fire within you, that prompts you to act, and inspire others to do the same. I also would like to bring another perspective, back to the personal. In the end, I believe all we do is motivated by our own quest for long-term, unconditioned happiness, and a lessening of our suffering. How we go about this has a lot to do with temperament, and inner and outer conditions. Some of us may choose a strictly contemplative life. Others become activists. Yet others, strive to strike a balance between the two. Not one size fits all here. Just an opinion, which of course, is worth little as far as absolute truth is concerned . . .
Marguerite, thank you for adding your voice here — please know that all perspectives and opinions are welcome on this blog (the only exception is hateful ones). I agree with you that temperament and the conditions of our lives do influence the form that our practice takes. But I’d also posit that there doesn’t necessarily need to be a divide between a contemplative life and an engaged, ‘activist’ life. (I actually find the word ‘activist’ problematic for a number of reasons, one being that it becomes too easy to pigeonhole a certain type of person into that role and then to think “I’m not an activist.”) I think of my friends who live and practice deep in the mountains of Tassajara Zen Monastery and yet find ways to address social issues even in that isolated, monastic setting. I think this may be what you are saying as those who strive to strike a balance. To me, it’s more about holding all beings in the mandala of our practice — and that can take many forms, depending in part on our personality types and other factors. But what I have less and less patience with these days are Buddhist practitioners who feel that their practice has no relevance to the world of politics, the economy, etc, and that those worlds should not be mixed with their practice. We live in this world, we practice with all beings, they practice with us… the mix is unavoidable, and really is a blessed thing. That’s my view. thanks again for engaging here! I’m so sorry for your loss, Barry. She seems to have been a truly generous peosrn. It’s also a mark of your capacity to love that you were able to nourish the relationship.I too have trouble with the platitudes of just breathe or just sit or open your heart having learned the hard way that an open heart can be an invitation to a trashing party!What stuck with me in this statement is the opportunity to encourage others to reach for what is possible and even for what may only seem impossible because of the mind of poverty the mind that says, Oh, this is all I’m good for/deserve. I think back to your encouragements when I first came on scene and how you fostered the mind of boundlessness in my efforts. That’s where I place my mind in this moment to value your teachings.That being said, I like that the topic is troublesome. No other way to develop except by creating trouble to go through, eh? Your point of taking on the words of the teacher brings us to the ko-an of Gutei’s finger. How do we truly embody the teachings so that all beings might benefit? I have so many thoughts about the Symposium and in a perfect world I would sit down with you over a pot of tea to unpack them. A lot of them pertain to the issues I lay out in the piece quoted here. Wish that you (and other readers here — hey NellaLou!) had been at the Symposium, too. Anyway, I’m laying over in Atlanta on the way back to SF, so I don’t have anything to add now but I’d love to continue the conversation soon. And your descriptions of Robert Aitken Roshi make me excited to read up on him. I’d never heard of him before last week but it seems like he was a profound inspiration to many of the dhamma folks I most admire. Wow, we should get that pot of tea soon! I will be in the Bay Area in October for the Buddhist Chaplaincy Symposium in Redwood City… maybe we can find time then. Thanks for being the awesome, honest writer and person that you are… looking forward to more connections.